Ten years ago, The Gotham Gal and I were rockin’ the suburbs in northern westchester with this record. We had recently left the city in an attempt to become suburbanites. The attempt failed and we came back to NYC in 1999. 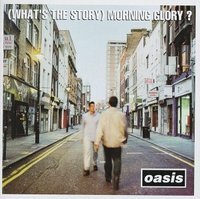 Oasis’ Morning Glory was one of the records that provided the soundtrack for our life in the ‘burbs. This is the best record from a band that never quite lived up to its hype. But what a great record this is. I think Wonderwall is their best song, although I might like Champagne Supernova better. The Gotham Gal loves Oasis and so do I. And we never tire of this record. And so it goes onto My Top 50.